Daily Specials - Rainbow Restaurant & Diner - Best Homemade Food in New Berlin, WI! We say Homemade... we mean Homemade! All our Daily Specials are made from scratch! Some specials even take a few days to prepare... simmering the base for our sauce for hours or browning each piece of meat before we slow cook it in the oven! 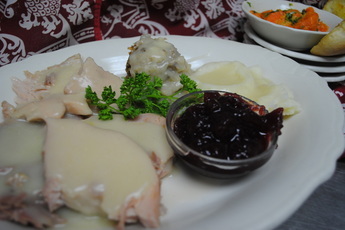 Turkey Dinner There is no doubt that our turkey dinner is the number 1 special on our menu... you may have noticed we cook it every month! Why is it so good? First we slow cook our turkey in our Alto Sham for hours! (think of it as a giant slow cooker). The white meat is so juicy and tender! Secondly, a turkey meal isn't complete without stuffing! NO boxed stuffing here! Our recipe includes fresh breadcrumbs, pork sausage, onions, celery and a secret ingredient or two... all mixed and baked that morning. We also make our own fresh mashed potatoes. Even our gravy is made just like grandma's... we start with a pound of butter and the juices from the turkey. That's right, good old fashion flavor! Mmmm good!